Summary: Wild sea turtle populations, already listed as threatened and endangered, are under increasing threat from a fatal virulent cancer, fibropapilloma (FP). This is undermining the health of turtle populations, within Florida and globally. Currently, there is no means of predicting the rehabilitation outcome of stranded sea turtles afflicted by FP. Without this predictive information, rehabilitation managers cannot appropriately prioritize the allocation of limited rehabilitation resources to maximize rehabilitation success rates and return the greatest number of healthy sea turtles back into their wild populations. This project aims to develop an improved, yet easy to use, FP classification system, which is urgently required as the current system cannot adequately differentiate between mild and severely afflicted turtles and fails to correctly predict rehabilitation outcomes. Clinical decision-making in human treatment has long been assisted by predictive tools designed to accurately assess the likely outcome of patients. In clinical oncology the most widely employed approach to predicting patient outcome is the combination of molecular biomarkers with tumor staging scores. The use of biomarkers (disease-related genes, proteins, metabolites, etc.) greatly enhances our ability to predict outcome and segregate patients into effective treatment cohorts. We will improve the current FP tumor categorization system and develop a simple blood test to predict likely turtle outcomes upon stranding and admittance to Florida’s rehabilitation facilities. Results: We successfully announced the grant award through a press release on our institutional websites and social media. We also submitted a press release to our press contacts in northeast Florida. This resulted in the award being publicized in the St. Augustine Record and in a six page article in the Pelican Post. PDFs of this coverage were submitted along with the 6 month report. 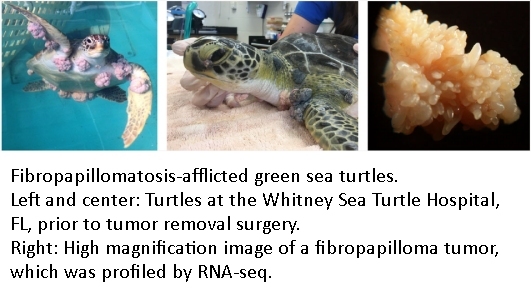 In addition, STGP funding has been highlighted in the release for an upcoming special sea turtle focused public lecture at the Whitney Laboratory for Marine Bioscience (https://www.whitney.ufl.edu/articles/next-evenings-at-whitney-on-june-14---sea-turtle-showcase.html). Research related to the funding has thus far resulted in two papers already accepted for scientific publication and a further three currently submitted or in preparation. These scientific papers reveal the underlying molecular drivers of FP tumors, novel treatment strategies, the effect of FP tumor removal surgery on patient behavior, and insights into FP's environmental and viral co-triggers. Furthermore, they examine whether visual-based methods of classifying FP tumor growth have any predictive power in relation to patient outcome, as well as detailing the most promising blood-based genetic biomarkers we identified. We have successfully promoted the STGP-funded research in a variety of scientific, public and rehabilitation community talks, the results of the project and recognition of STGP support will continue to be incorporated into similar talks in the future, disseminating the findings to an ever larger number of individuals.